I guess I never really came up with a name for this tune. Sometimes I will write lyrics and give it a working title. I do the same thing with musical pieces I am working on before there are dedicated lyrics assigned to the tune. As I continue to work on a piece, the name often changes when chords are matched with a set of lyrics. On rare occasion it happens at the same time, and that process is a little different – and easier! This is one of those weird situations where I never got to either, and this has always been referred to by the date….. March of 1990. March in this case also has a double meaning. It is the pull away from the Winter season where I live. The steady movement of new life. The pace of growth that cannot be stopped. The instrumental tries to match that drive and frantic pace of the season. Driving rhythms, collage of melodies, bouncing themes – and then to dynamics and a reflection of what is now past. Then back to driving growth. That is what I think about as I listen to this tune. Even now, heading to Winter, I feel that March pushing forward. Back to the Atari 1040 ST, I am sequencing all parts for this tune. I believe I added a new tone module from EMU called the Proteus 1. This was an amazing machine and I have not found anything as good and simple to use as the Proteus series. It was really cool for two major reasons in my opinion. 1) the sounds were just awesome for the time and there were lots of sounds on board. 2) the operating software used was just made for MIDI geeks like me. It was very simple and allowed the Proteus 1 to create splits, layers and zones, but it easily allowed you to access all 16 MIDI channels at the same time. I could write a few articles on this alone, but for now it meant you could assign a different sound to any or all of the 16 channels independently. As described in the MIDI series, this was great because you could use channel 1 for piano, channel 2 for organ sounds, channel 3 for strings, channel 4 for brass or orchestra sounds, 5 for flutes, 6 for sound effects, 7 for guitar sounds, 8 for solo instruments, 9 for the bass guitar sound, 10 for the standard drum channel and still have channels left over. Playing out in bands and in the studio with this was just a dream. Rain comin’ down like it usually does. Playin’ the same songs as the other night. Now you find me driving in your neighborhood. Everything you do for me is for my own good. So I punched it down and left it all behind. Racing fast to nowhere on a one way track. And the crackling of lightning tearing into the night. I tell them only one thing makes me feel all right. It makes me feel all right. Think of the stage as a speaker sitting in front of the audience….. sometimes the club or venue actually looks like a box where the performers are positioned. You have the low-end Bass Guitar, Kick Drum and Floor Tom and maybe keyboard sounds or textures. You have the Guitar and Vocals in a mid-rangy area and at the upper end you have symbols and higher range Guitar and Keyboard sounds. All inside the same box just a blasting away at different levels and pointed in all directions. Now you have a better understanding of the challenge of making these various chunks into a tasty audio stew! For the best way to present music to the savvy listeners of today, we do what has been done for decades. In the stereo image, you want to create a “room” or “place” for the listener. We have become comfortable with the very low end sounds coming from both speakers at about the same volume. This places the sound to the center of the listener’s field. We like the vocals or in most cases the melody line to be in both sides equally, again placing the singer in the middle of the left-right field. We are fine if other instruments or singers are more to the left or right as long as the main sounds are where we expect them. We usually place big speakers on either side of the stage facing the audience…… usually in front of the stage and performers…. But as mentioned above this is not a finely tuned speaker cabinet by any means. The components are not necessarily proportionally balanced in volume or location. Setting up the Stage and PA system with this in mind can help reinforce the natural stereo image out in the audience. Now that I have made a connection that is awkward if not confusing, even though the PA system in all likely hood is a Mono mix coming from both sides or columns of speakers, the listener still hears this as a stereo field. They want the low-end sounds or tones from the center of the stage. Typically the drum – the Kick Drum to be specific for this example – is the most used and most amplified instrument in band situations or where you have audio media. The Bass Guitar player is usually next to the drummer. This helps them keep tighter timing and solid beat, but also supports the stereo image of the listener. Guitar and other amplified instruments on stage can be heard more from their side of the stage than from the other as an easy example, even if the volume through each side of the Main is sent the same level signal. If keyboards are on the opposite side of the stage from the guitar and also uses a monitor or amp, standing closer to them in front row can make it seem like the keyboards are too loud and those on the other side of the stage think the guitars are somewhat overbearing. It won’t stop them from standing there though! As you get further away from the front of the stage or if the venue is very large, this stereo effect has less and less meaning to the listener. Still, as a rule, most sound systems do not place low-end PA cabinets (or dumps) on one side of the stage and the mid or hi-end cabinets on the other side. It can be however, advantageous to place the low-end dumps in the center of the stage or along the front-center stage area. To make this more inclusive, it is also more comfortable to hear low-end tones coming from an elevation point lower (on the floor, for example) and the higher tones or frequencies coming from higher points (mounted above the stage or on tall poles). If the volume on stage becomes to strong a level it will negatively affect all the above and more. To reinforce another post of mine, musicians just need to worry about performing great – we sound geeks will make them sound good and loud! I keep dreaming. Most of the connectors used for outputs will be 1/4″ male jacks. These can be for ‘grounded’ (three-wire) or two-wire cables. To make this part confusing, the cables can be made or changed with adapters to almost any connector type. For long distances we prefer grounded or three conductor-wire cables as the third wire is used to take common signals from the other two wires, and ‘dump them to ground’. Common signals would be interference and noise as the plus and negative wires are carrying the signal from the board. The result is good signal with low noise introduced. Guitar and keyboard cables typically go shorter distances and typically have a higher or stronger output signal than a microphone for example. The cables in the snake will use three wire grounded shielded cables even if they are 1/4″ male connectors. So we might expect to have an XLR connector for the Main Outs to the Main House power amps, but this is not a guarantee. If 1/4″ jacks are provided it is recommended to use grounded three wire cables. Most cables will provide a male connector on one end and a similar but female connector on the other end. Male connectors are often used to connect to In-Puts and Female connectors are often used to connect to the Out-Put. The male connector of the microphone cable connects to the mixing board In-Put and on the other end the female connector will connect to the microphone out. Generally speaking there is little advantage plugging an in to an in or an out to another out. I like to state the obvious LOL! The mixing board will give us a Main Left and Right out, and probably a Mono Main Out. These will be connected to the Main or House power amps. During an event, the amps are usually turned all the way up and the House volume is ultimately controlled by the Main L-R faders on the mixing board. This is why it is important to turn the Master Volume Faders on the mixing board all the way down whenever connecting or disconnecting equipment or making dramatic changes. Depending on the board size and configuration you may also have a 1/4″ Direct-Out for many if not all input channels. (this is REALLY cool for recording and a lot of other creative uses…) These can be really handy for independent channel recording, triggers, audio effects and alternate mixes to name a few. Basically connect these to external recorder, processor or triggering gear as needed. I will give some examples as the series expands to other main topics. You will also have a number of Sends that are used for a variety of tasks and have different names, but with a few configuration details are for the most part the same thing. Effect Sends, Monitor Sends, Auxiliary Sends, Sub Sends are splitters; they split the signal – keeping the one going to the House or recorder – and allowing you to send a lot or a little of that signal to the Send of your choice using the Send knob. As in the Monitor amps and House amps, the volume knob will ultimately be used to send the proper signal level to the external (and internal) devices or effects. If you ‘send’ this to a digital delay, it may also have its own input and out put level knobs. You may also have a two-track input and/or out put. This is for playing stereo audio devices and for a straight stereo record out option. Handy to listen to practice tapes, intermission music, PA system tests and other performance related media. I don’t mind acknowledging that I am different than a lot of the people I know and hear about. I am PERFECTLY OK with this. I know my music and lyrics are not the typical main-stream songs blasted everywhere. I will not appear on any searches. Growing up and watching all the Westerns and TV shows, I never – not even once – wanted to be the cowboy or the soldier. I identified with the ‘good guys’ as most kids do, but to me the cowboys and soldiers were not the only good guys. I identified more with the American Indians living with nature rather than conquering. I am not sure what exactly inspired this song when I started it. I often think about music videos and how that could help explain through images some of the themes in this musical piece. Possibly the new toys that could make sounds that added less traditional Western culture ideas and more ethnic and international instruments. I also like contrapuntal rhythms and themes, so you will hear a lot in these pieces. I want to give you an idea of perspective on some of the articles I have posted and will continue to post going forward. This is the first video I have posted and while it is rather BORING, it is so informative at the same time. I guess I have recorded original tunes since the very late 1960’s. I recorded everything. I deleted a lot! But I recorded everything I could. I experimented and adjusted and re-did and failed a few more times than I succeeded in the early days to be sure! I also got into photography and then into video recording. I practiced the mundane over and over until I got the exposure right, then with video until I could zoom and focus manually. I joined the photography club in high school and learned to develop and enlarge my own pictures – something I thought was close to magic back in the day! I shared earlier that I used (and still own!!!) what I think was the first personal computer to come out with built in MIDI ports – The Atari ST! I used a software program back then to record the MIDI tracks and I could generate SMPTE time code and send a signal from the Atari to sync it up with recording machines (I had the Yamaha 4 track CASSETTE recorder during most of this). When I talk about old technologies and how we used to record songs (or develop pictures…) It is hard for some to understand the challenges we had and the lo-fi quality of the final mix or product. I want to use this video as an example of many things I refer to in this blog. In this video, you will see what I saw when looking at the Atari computer monitor when I was playing or recording tracks. Keep in mind this is all MIDI equipment available years ago. The song I posted earlier will now be stripped of all guitars, vocals, effects and additional live sounds you heard on the full mix. As you watch the video you will hear the sequences being played back live into the VCR input. I took the monitor video out and connected to video in of the video recorder so this is a straight feed for both. In the recording software, each “instrument” has a separate track. Drums are all on one track with additional percussion sounds on different tracks, and as a reminder, each note (as triggered from my DX7 keyboard) represented a different drum/percussion sound coming from a drum machine. You can hear the metronome from the Atari ticking away in the back ground as it is set to record. As each track plays you can see the musical notes light up depending on the intensity of the track information. You can also see the tempo of the song, the names of the tracks and the measures and beats as they click by. The main piano sound is probably familiar to many of you even if you are quite young. It is the classic Piano Tine sound from the Yamaha DX7 synthesizers. This video should also give you a sense of quality and resolution available at the time. It might be difficult to hear the difference in song recording quality today, but we are all familiar with video resolution and HD cameras and large screen TV and computer standards available now. Just think how this applied to the audio quality back then and then play some really old songs you grew up listening to. It gives a better appreciation and perspective for some of the classic songs that seem to live forever. For me, sequencing is fun and very versatile. I am not the kind of keyboard player that can jump in on any song and just start jamming. I do better if I can take my time and learn, practice, and improve before practicing with a full band. A lot of this might be from the lack of confidence in the early days, but in reality I find myself a jack of all trades and master of none. If I had spent more time on any one instrument, I might have gotten pretty good. Fortunately – or unfortunately, I have always been interested in so many different things that my chops were not the best. As a percussionist, I was able to hear what I wanted, but did not play drum kits so my feet and hands were always locked in perfect step! Sequencing gave me the ability to lay down rough performances on the keyboard (and remember I use the keyboard keys to ‘trigger’ the drum sounds, so I am still playing keys). Once recorded using MIDI – again I am not recording the sounds but the physical action and movements, I could enter the Edit Mode on the sequencer and make corrections to timing, notes, durations etc. until the piece felt good to me. For the drums, the standard practice is to use the Quantizing feature (I can go into this later as well for future posts) to make sure all beats were perfectly ‘on the grid’. I have used drum machines and sequencers since they first came out. The sounds are great but too often the result of overusing the quantize feature makes the drum tracks sound mechanical – unmoving – and even impossible for a real drummer. I preferred to leave a little slop here and there. I want emotion in my songs, not perfection. In “Bassics”, I just enjoyed the new sounds I had and played with this Bass Guitar patch and came up with the basic groove. I like adding textures and unusual percussion/FX sounds to keep the songs flowing and changing. Available sounds are so much better now, but I still enjoy bringing out these old tunes. Live Sound Reinforcement Series Chapter 16 – Coke or Pepsi? Mac or PC? 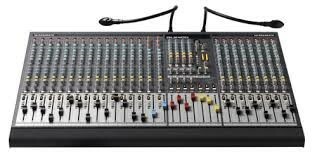 The sound board or audio mixer represents the hub in most audio mixing and mastering functions. everything connects to the board. Even the lighting system will use channels in the snake to connect from stage to console. Things get plugged into and things get plugged out of the mixer as needed. Today’s mixers are blue tooth USB WiFi fire-wired and light-piped together and will connect to an amazing array of devices. So far we have focused on what gets plugged to the Inputs of the sound board. There are a number of connection possibilities for the Outputs as well. We have already discussed some of them earlier, so this can be brief as you already know a lot of this in general. 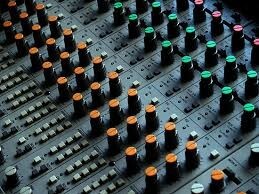 On most sound boards you have a number of analog-out options. In earlier discussions we talked about XLR and 1/4″ cables and connectors. These will continue to be the main ones used for outputs. On the front or face of most mixing boards you will see a stereo headphone out. It will usually have its own volume knob and probably a selector to pick the options to Monitor including Stereo Out, Solo, Effects Sends, Effects Returns, Sub or Groups, Auxiliary Returns, and other options. On the back or the top of the mixing board you will see the panel for Out-put connections in different sections. There are some rules to determine what type of Audio Cable is used and whether it is a male end or female end and whether it has two connectors or three (or more). In the early days of mixing boards, microphones and keyboards, it was important which brand you purchased. If you wanted to get ‘that sound’ you had to have this mixing board channel strip or that particular keyboard. Later on the computer industry similarly shot through their early days and you had the Macintosh or the Windows PC. If you were brought up with one you could not be talked into the other. Most modern equipment from PC’s to Automobiles can do everything. They all have similar platforms and emulators. There is style and quality as there always will be, but you can get software mixing programs and microphone/guitar emulator plugins that will make your audio tracks sound like anything you want —-THEY CAN EVEN MAKE YOU SOUND LIKE YOU ARE SINGING IN TUNE!! So if you like Pepsi, no problem. Want Coke? Press this button…… More comfortable using a Mac? Go for it. All it takes is cash, a thorough understanding of what all the terms mean and a good idea where all the buttons are?!!? I am famous for doing things the easy way and if I can, as cheap as possible. Now that does not mean forget quality and versatility. It means I won’t spend money on gadgets that I don’t need. I try to run as clean a mix as possible, and making sure everyone gets heard. If they are up there ‘playin it‘, I want the audience to hear it. In reality, it doesn’t take a lot of gadgets to accomplish those two major things; make it sound good and loud enough for the venue, and put all instruments/vocals/strings/spoons or tambourines, I don’t care what it is…. in the mix. As a band member, hiring sound guys and their rigs, a number of times after sound check and a few songs of the first set, my microphone was turned down so low, no one could hear me even in-between songs. I could not get the sound man’s attention, or anyone else’s for that matter because no one could hear me (and as a keyboard player I was usually in the back corner of the stage in the shadows Ha!). So eventually I just adjusted the microphone stand down toward the floor in front of me. It is easy to hit the wrong button or turn the wrong knob; happens all the time. Remember that the sound guy cannot hear what is really happening up on stage. Sometimes you THINK you can. But you as the sound engineer should be the first person to know what is going wrong when it does. Keep an eye on all performers – they will look to you first. As a performer and studio guy, I could tell when the guitar player broke a string, or if the drum head split and when or if the drummer had too much to drink on his birthday gig. Things will go wrong but a lot of the time it is the sound guy. You make an adjustment and grab the wrong knob. They all look alike in the dark part of the venue or room. The consequences can be anything from a non-event to a full blown crisis, depending on which knob you grab. Obviously for the extreme crisis, you will know right away what happened and will probably be able to correct quickly. It is the slow creepy ones that will get you. Two songs later something changes on stage and chaos begins. I suggested we set up the mixing board so the FX Returns are plugged into open channels so you can control their volume with the faders rather than the FX Return knobs. I always turn the effects down in-between songs. (you also get EQ and other benefits) This makes it SOOO much easier to see in the dark clubs. I also use the sub-groups to assign drums, vocals, and other groups of mics their own fader that feeds directly to the Main Out or house out. If there is a problem with one group, you can quickly test by adjusting that sub-group fader and see if problem goes away. If not, return it to where it was and go to the next sub-group. This way you do not have to go through fader after fader searching for a bad signal or feedback loop. Once you narrow down the offending group, you will have a much better idea what the source is! I would say most live performances the sound board is mixed to a Mono output. In smaller rooms or clubs, I loved running in stereo. I mixed for keyboard progressive bands a lot and the stereo keyboards and samplers consumed the rooms when mixed right. Not in volume——– The vocals (sometimes three sometimes five in the band) panned as well. Overkill in a way, but not much work and easy to arrange with equipment versatility. Most boards have stereo FX that can add lot to the imaging. But again, that is not the norm. So you can either set board up in stereo and have the Main Output plugged into the MONO OUT to your system, or you can mix to mono and use one Main fader or the other. That’s about it. We have covered the entire mixing board, in its basic format. Headphone outs, Tape or other inputs, on-board effects, Solo or Audition functions as well as digital features make new sections. As we continue down the signal path, we get to a new section. This is separated from the EQ section and generally uses a different color coding for the associated knobs. The next group is the Aux Sends. Each send represents an output jack that will go to external audio sources. 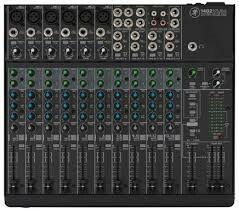 One example would be the stage monitor mix(s). If you have two monitors on each end of the stage serving performers, you can use Aux Send 1 going to the left monitor and use Aux Send 2 going to the right monitor. If performer 1 wants to hear themselves and a little bit of performer 2 in the same monitor, simply send a lot of performer 1’s channel to Aux Send 1 and a little of the performer 2 to the Aux Send 1. If performer 2 does not want to hear performer 1 in their respective monitor, simply turn up performer 2’s channel Aux Send 2 up a bunch and do not turn up Aux Send 2 on the channel for performer 1. That was probably harder to say correctly than actually doing it. You can use Auxiliary Sends to route a signal from any channel to external effects boxes like Digital Delays, Reverbs, and even recording devices in a pinch. You can use it to trigger light boards that have an Audio Input mode. These Auxiliary Sends can sometimes be switched from Pre to Post. Some are fixed either way. This can also get confusing but if the channel Aux Send is in Pre mode it means Pre-Fader. The volume faders on each channel will affect the level of the signal that is sent to the House or the Main Out of the mixer and when selected, to the headphone out. It is a good idea to solo instruments in the headphones to pick or change microphone locations and isolate room noise and other performers. If the Aux is set to Pre-Fader, it means that the Aux Send levels will be determined before the channel fader has any effect. Turn the channel volume fader all the way down and you will still have plenty of signal going to the Aux Send. If the Aux Send is in Post Fader mode, the amount of signal sent to the Aux Send for that channel will be directly affected by the level of the channel volume fader. Fader off = no Aux Send level. The number of sends will vary widely. In this case, more is better! At this point the example starts a new section. This will affect the Main Out section. This is where we can set the stereo Pan position, Mute or un-Mute the channel, and Solo the instrument for gain staging and troubleshooting during a performance. When running in stereo, general rule is very low frequencies get panned to center. After that, adjust to performance and venue. 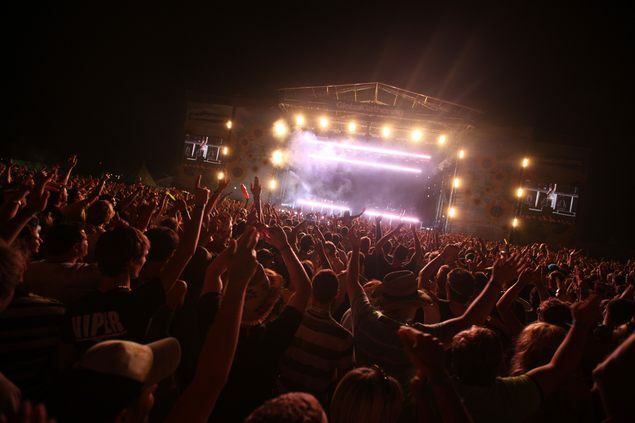 Sometimes the stage sound is very loud, and listeners close to the stage will only be able to hear that performer. Sometimes the shape of the stage or design of venue will require creative solutions using stereo panning. This strip includes a pair of colored LED’s for signal strength and Peak warning level indicators. Occasional red for short periods of time are OK, but better to avoid as long as you have a strong signal otherwise. After we have set the various knobs correctly and have good signal strength, we can use the channel volume fader to set the level of that channel in the House mix. Channel Mutes can have different affects. Some boards Muting a channel will stop that audio source from all outs, and some might allow Aux Send 1 & 2 for monitors. See manuals for lots of details I cannot cover in these articles. But here is the good news; we have just learned 75% of the face of the mixing board. Each channel duplicates what we just went over. All those knobs are now grouped logically, easily identified explained and we understand what each one is for. Here on in it is repetition for gain staging and sound check. Use Pad and 1st Gain Stage to adjust signal strength, add or subtract frequencies using the channel EQ, set amount of Aux Send to monitors and effects and set the stereo field positions as we watch level indicators and set channel volume fader. Repeat. Finished!